These rooms are all about getting down to business, but it doesn't mean you can't make them beautiful. Everyone knows that kitchens and baths are what sell a house. But let’s be honest. These are rooms where business is conducted, and sometimes they aren’t the most fun to photograph. But we traveled back through time—and the archives of D Home—and chose some sleek kitchens and lovely loos that are the exception rather than the rule. 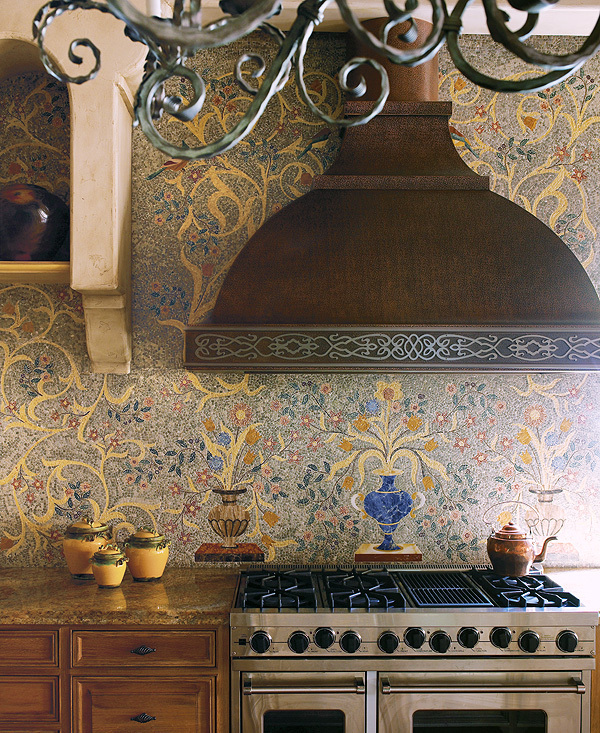 Why we love it: It took months to create this 7-by-18-foot mosaic marble tile wall. First, designer Lynn Sears sketched the pattern. Then it had to be turned over to an artisan. The result? A work of art—the flower urn features a rare blue marble. We have to believe that it somehow makes whipping up Kraft Macaroni & Cheese a little more romantic. Why we love it: When we visited Charlotte Comer’s cottage in Vickery Park, we likened it to spending time in a storybook. The master bathroom is no exception. 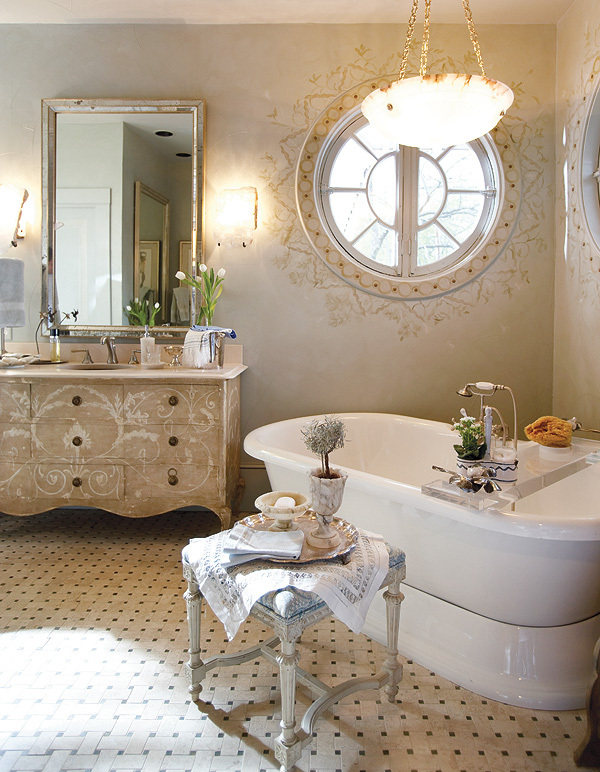 We can imagine awaiting our prince while primping at the custom Italian vanity by Renaissance Collection and soaking in the bathtub by TKO Associates. The serene setting would surely make the long, long, long wait a little easier. Why we love it: We love every inch of Emily and David Corrigan’s Bluffview home. Designed by Emily Summers, the place has the feel of a treehouse, thanks in part to the four flights of stairs required to get to the entrance. Don’t get us wrong—this is a fancy treehouse. 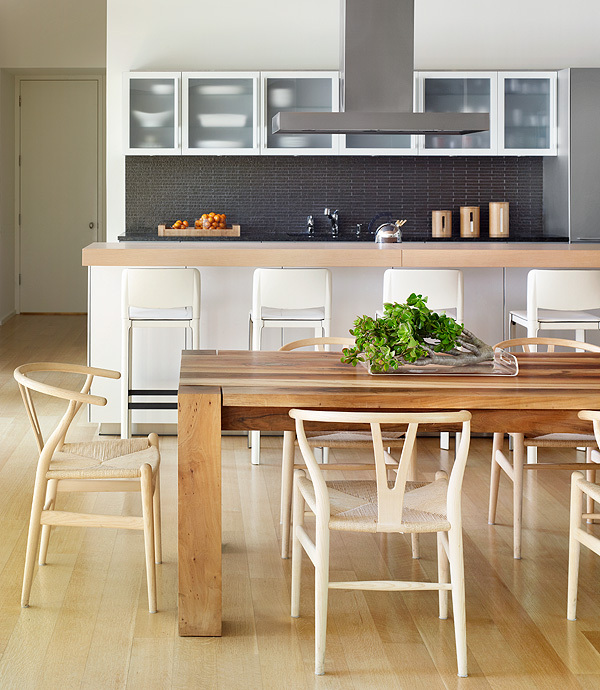 And the sleek kitchen featuring vintage Wishbone chairs by Hans Wegner and a credenza from Scott + Cooner makes takeout in order. The room is simply too pretty to junk up with food.